TransferPlan will transfer you from and to Agios Nikolaos as quickly, safely and comfortably as possible. Agios Nikolaos lies 63km east of Crete’s capital Heraklion, north of the town of Ierapetra and west of the town of Sitia, Lasithi’s capital. 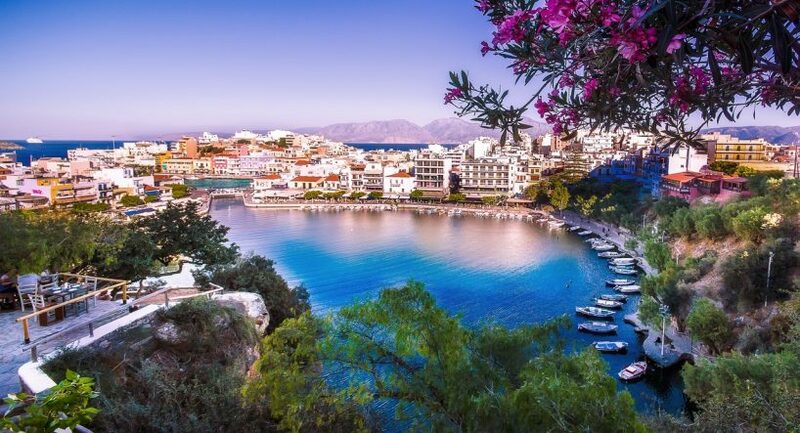 Agios Nikolaos is located along a hilly terrain overlooking the coastline and the idyllic Mirabello Bay. Agios Nikolaos is unique amongst other Cretan urban centres as it manages to mix a blend of artsy, leisurely, sleepy and yet vibrant environment. It is the cosmopolitan capital of the Lasithi prefecture and boasts 20000 permanent inhabitants. The name of Agios Nikolaos is derived by the old Byzantine church located west of the city. One of the highlights of Agios Nikolaos is the Lake Voulismeni, a lagoon of extraordinary beauty riddled by legends and myths. It is said that in its eerie scenery goddess Athena used to take her baths in it. Moreover, it was a common belief that the lake had no bottom, until 1853, when a British admiral ordered soundings to be taken and found out a bottom that reached to 200 feet in depth. Nevertheless, the assumption that the lake was indeed bottomless was used even in modern times to attract tourists in the town. Apart from taking some long walks around the lake and appreciating the mesmerising landscape, one can take the opportunity to dive into the serene waters of the lake and spend some quality time surrounded by nature. Agios Nikolaos offers a number of other excellent attractions, such as splendid neoclassical architecture, well maintained buildings and a network of stairs around the steep city, the marina, All Saints Island which is home to the endangered species of Cretan wild goats, Kitroplatia square which houses some shops, cafes and restaurants and the Gulf of Mirabello which is of unique beauty and should be one of the 'must sees' if you decide to make your way to the city. Book your private transfers now. Enjoy a high-quality service at the lowest prices. Best price guaranteed. That’s why we are Crete’s favourite airport transfer company. TransferPlan will transfer you from and to Heraklion Port as quickly, safely and comfortably as possible. Heraklion port is situated at the center of Heraklion Prefecture’s northern coast and adjacent to island’s capital. The modern Heraklion port was firstly established in the 20th century and expanded eastwards of its older predecessor, the 700-year-old Venetian port that now serves as an attraction and a place of pleasure. Heraklion port is the second largest and busiest harbour in Greece after Piraeus. The port is conveniently located along the middle part of the Cretan highway that serves the northern part of the island. The highway offers an easy getaway to the towns of Agios Nikolaos, Sitia, Kissamos, Rethymnon, Chania and Heraklion. It is busy all-year-round with an approximate number of 2 million visitors annually. The port services very popular routes such as Piraeus-Athens, Thessaloniki and a number of Aegean islands. Itineraries are regular and for other major ports, ships depart daily. The Harbour hosts visitors for both touristic purposes and commercial activities. It possesses an array of facilities for the convenience of all travellers. In close proximity to the port, one can find in abundance shops, cafes and restaurants within a short walking distance. The port is an 'umbrella' term covering both the new Heraklion Ferry Port and the old Venetian Harbour. The 'Castello a Mare' more widely known as Koules is a significant walled structure marking the entrance to the old Venetian port. The fortress dates back to the 16th century and is presumed that Cretan rebels were tortured in its underground chambers by mercenaries of the Ottoman Empire during the times of Crete's occupation. The Heraklion old town is located nearby, thus after a visit to the Fortress travellers can enjoy a walk through the vibrant streets of the city or taste some delicacies prepared by the friendly and hospitable locals. Book your Heraklion Port transfer now. Enjoy a high-quality service at the lowest prices. Best price guaranteed. That’s why we are Crete’s favourite airport transfer company.